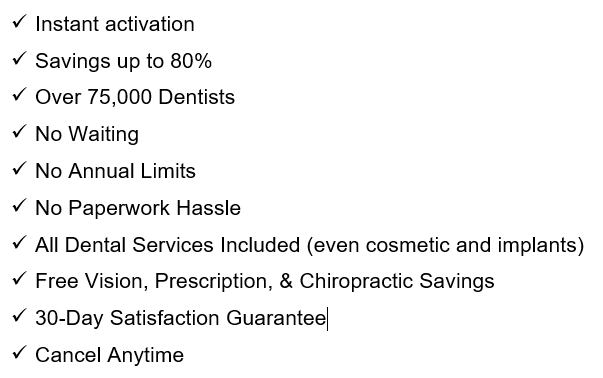 When you join AmeriPlan today we are going take all the risk and GUARANTEE you will be satisfied and enjoy great savings at the dentist. If you ever decide you no longer need the plan, just let us know in writing and we will discontinue your membership. If you need to cancel within your first 30 days we will refund your membership fee. There is no contract. You may cancel at any time. You will receive everything you need to use the plan by both email and postal mail soon after you enroll. "I needed a tooth pulled. It was going to be $380.00. I signed up, and I saved A LOT. My dental work was only $110.00 instead of $380.00. Also, my prescription was only $7.00 instead of $80.00. Thanks AmeriPlan!"